Book thirteen of the celebrated Deverry series, an epic fantasy rooted in Celtic mythology that intricately interweaves human and elven history over several hundred years. 'A dagger laid against our throat.' So Prince Dar of the Westlands calls Zakh Gral, a new fortress built by the Horsekin, the ancient enemies of his people. To help him destroy this threat, the elven prince has called upon his allies: the dwarven folk of the northern mountains and the human men of Deverry to the east. Their leaders know that if the Westlands fall to the Horsekin, their own throats will feel that dagger next. Joining them are two powerful dragons, who have their own bitter reasons to hate the Horsekin. But the fanatical Horsekin believe that they have the most powerful ally of all: a new goddess. Alshandra's priestesses have announced that she has given the Horsekin the lands belonging to the prince - and that his people must be utterly destroyed. 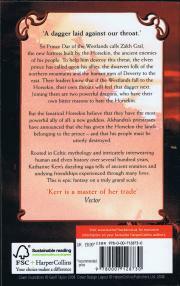 Rooted in Celtic mythology and intricately interweaving human and elven history over several hundred years, Katharine Kerr's dazzling saga tells of ancient enmities and undying friendships experienced through many lives. 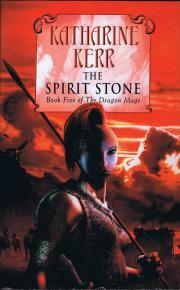 Epic fantasy on a truly grand scale.